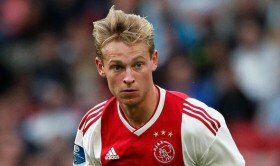 Tottenham Hotspur have reportedly joined Barcelona in the race to sign Ajax midfielder Frenkie de Jong. The 21-year-old was heavily tipped to join the Catalan giants during the recent transfer window but a deal could not be finalised in due course. Despite this, Mundo Deportivo claims that the Blaugrana are very much in the driving seat to pursue the Dutchman but Spurs are deemed to be planning a surprise approach for the midfielder. Spurs boss Mauricio Pochettino is said to be a huge admirer of the youngster's talents and he is supposedly eyeing him as a probable replacement for Belgian midfielder Mousa Dembele. Dembele currently has just 10 months left on his existing contract with Spurs and reports have suggested that he could be sold in the New Year with a big-money move to China in the horizon. Aside from De Jong, Spurs have also been linked with a probable approach for Hector Herrera, who has been plying his trade for Porto for the past five seasons.